For over 20 years, attending a day’s play of the Lord’s Test Match has been part of my summer ritual. Sadly, for almost as long, this has meant putting up with not particularly great coffee or going without. However, this changed in 2011 when London stalwarts, Kaffeine, were brought in to make coffee in the Harris Gardens behind the pavilion. The Harris Gardens offers sit-down breakfast and lunch on match-days, with Kaffeine providing the coffee. However, before the start of play, takeaway customers are also welcome, making it an essential first stop when you get into the ground. Once play has started, though, you’re largely on your own, although I find that if you were really nice to the baristas when buying your morning coffee, you could dodge past the waiters at lunchtime for a cheeky flat white. Knowing Peter, Kaffeine’s owner, probably also helps. Let’s start off with Kaffeine. I’ve written extensively about Kaffeine at Lord’s, so I won’t say too much. These days, as well as the operation in the Harris Gardens, Kaffeine is serving in the Media Centre and at the top of the Mound Stand. Sadly, both of these are off limits to the general public, so make sure you head over to the Harris Gardens before the start of play for your Kaffeine fix. Kaffeine also serve from 3:30 onwards (just in time for the tea break), so if you miss out at the start of the day, you can always catch them later. However, none of this was much comfort to me at 11:30 and in desperate need of good coffee. Wandering out of the Harris Gardens, Coffee Space caught my eye. This large stand is next to the Harris Gardens, just to the left if you enter by the Grace Gates. I was relieved to see some familiar faces behind the counter, including Diana, winner of the first Beyond The Bean Barista Bursary, and Paul, ex-Origin, both of whom are multiple barista championship competitors and some of the best in the business. Surely they wouldn’t be associating themselves with poor quality coffee? As it turned out, they weren’t, since the coffee was from The Roasting Shed and I was rewarded with a very fine flat white. Smooth and served at the perfect temperature, this was a very welcome start to my day. If you don’t fancy an espresso-based drink, Coffee Space also has a single-origin filter on batch-brew. Since all the coffee at Lord’s is takeaway only, I always make a point of taking my own cup, although I’m a little wary of taking my glass cups in case they fall foul of the ground security (your bag will be searched on the way in). This time I’d taken my brand new Eco To Go Cup, a lovely 9oz reusable cup made from rice husk. Light and very robust, it’s the perfect travel companion, and easily fits into my rucksack. The day turned into something of a road trip for my new cup and it passed with flying colours. 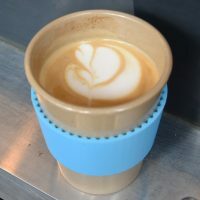 In all, I had four flat whites and really enjoyed drinking them from the Eco To Go, the cup never once distracting from the taste or texture of the coffee. At Coffee Space, Paul had mentioned that Browns of Brockley was also at Lord’s with its new coffee van, so at lunchtime I made a point of seeking it out, finding it down at the Nursery End, behind the Compton Stand. The van is a beautiful thing in itself, kitted out with a Victoria Arduino Black Eagle espresso machine (the only one in a mobile coffee set-up, I believe), complete with Mythos 1 grinder for espresso (Red Brick from Square Mile) and an EK-43 for batch-brew. Even better, the Black Eagle was set up at the back of the van, so I could stand at the end of the counter and watch my espresso extracting. Although I was tempted by the batch-brew option, I decided that in the interests of comparison I would have another flat white. This proved to be an excellent decision since it was the best of the bunch, really rich and smooth, with the best latte art too. The coffee van is a new venture for Browns of Brockley and has only been up and running since January. When it’s not a Lord’s, you can find the van at Brockley Market (Saturdays) and Victoria Park Market (Sundays), while Browns of Brockley itself is still going strong down by Brockley Station, open seven days a week. Both Coffee Space, which is a dedicated coffee events company, and Browns of Brockley, are at Lord’s this year for a variety of matches. Browns are at all the international matches as well as for the one-day cup final, while Coffee Space will be there for those matches and the one day games. I know that Coffee Space is also back next year, while Browns would love to join them, but nothing has been confirmed. Hopefully both are here to stay, although I suspect that this is largely down to Lord’s and how well things go this year, so if you do go to a match, take the time to fill in the survey that Lord’s send you after the game and be sure to mention how much you enjoyed the coffee! Another option is Portman’s Café, which is a permanent fixture under the new Warner Stand. Serving Union Hand-roasted, I believe that this is open on all match-days, both domestic and international, making a great option for county matches. I had a rich and creamy flat white there with some lovely latte art. Even better, Portman’s Café sells ice cream too. The final option I found on the day was Tom’s Coffee, another events company, this time based in Harrogate, serving its own Brazilian espresso. There were several Tom’s Coffee stands dotted around the ground, including a row of them at the Nursery End. However, I visited the smaller (and quieter) stand behind the pavilion, where I was well looked after by two lovely gents from Liverpool. The coffee, while perfectly drinkable, was not really to my taste. A darker roast than I’m used to, on the plus side, it was surprisingly sweet, although I found the milk a little too hot. An honourable mention goes to Ground Coffee Society which was also at the ground at the Nursery End. Somehow I managed to miss it though! In closing, it’s great to see speciality coffee getting a foothold at major events and I applaud Lord’s for taking the initiative first with Kaffeine and now with this impressive range of outlets. Hopefully it will continue in coming years. In the meantime, I look to other major cricket grounds to follow the example set by Lord’s… Watch this space! December 2018: Speciality Coffee at Lord’s was a runner-up for the 2018 Best Saturday Supplement Award. This entry was posted in London, Saturday Spot by Brian Williams. Bookmark the permalink.